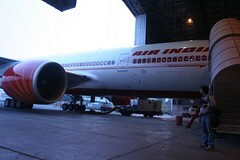 A truly marvelous experience to witness the new generation aircraft. Alas, we didn’t take flight and only got to see it in stationery mode. A few snapshots of the experience clicked by Krishna. Me staring at the huge aircraft up, close and personal. 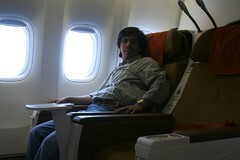 Seated in the Business Class seat. I loved those little reading lamps on the seat head. 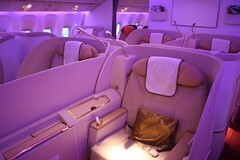 Ambient lighting mode witnessed in the First Class section. They had quite a few light settings, basically I think to kill the monotony of a 16 hour long flight. Those seats convert into fully flat 31 inch wide beds. And lastly, two shots which I took using Krishna’s Canon. My first ‘little’ experiment with a DSLR. 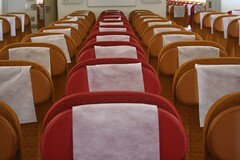 These are the economy seats. 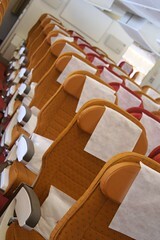 You look so comfortable in those seats!